Check out this Organic Earl Grey. 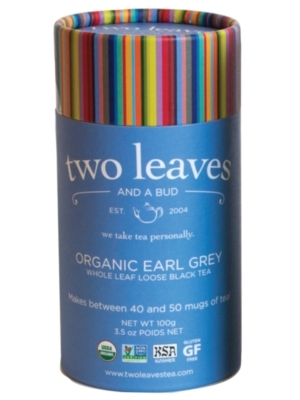 If you�re looking for a tea blend that will shed light on why tea is considered an all-encompassing drink in many cultures, then you have to try out the Organic Earl Grey tea from Two Leaves Tea! Each cup of tea will delight you with the strong and delicious flavor of black tea that is enriched using the flavor of bergamot oil, which provides fragrant orange tones! The cylinder packs 100g/3.5oz whole loose black tea leaves, offering between 40 and 50 cups of tea! Choose this blend anytime you need a healthy and multi-layered tasty treat!